GOODGOD Small Club ~ HOT DOG HAPPY HOUR IS BACK!! HOT DOG HAPPY HOUR IS BACK!! 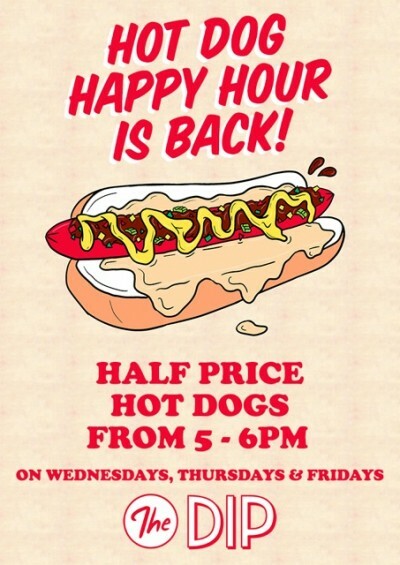 Hot Dog Happy Hour is returning to The Dip – get yourself to The Dip counter between 5 – 6pm on Wednesdays, Thursdays and Fridays to enjoy half price hot dogs! It’s your perfect chance to try all the hot dogs on our menu – and there’ll be special dogs added each week! Drop in and indulge in Six dollar hot dogs at The Dip! Every Wednesday, Thursday and Friday from 5pm – 6pm!